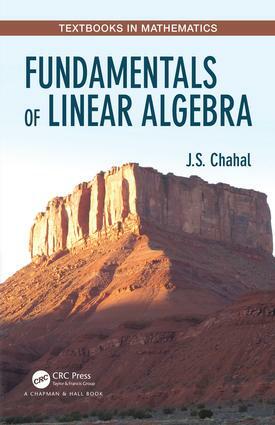 Fundamentals of Linear Algebra is like no other book on the subject. By following a natural and unified approach to the subject it has, in less than 250 pages, achieved a more complete coverage of the subject than books with more than twice as many pages. For example, the textbooks in use in the United States prove the existence of a basis only for finite dimensional vector spaces. This book proves it for any given vector space. With his experience in algebraic geometry and commutative algebra, the author defines the dimension of a vector space as its Krull dimension. By doing so, most of the facts about bases when the dimension is finite, are trivial consequences of this definition. To name one, the replacement theorem is no longer needed. It becomes obvious that any two bases of a finite dimensional vector space contain the same number of vectors. Moreover, this definition of the dimension works equally well when the geometric objects are nonlinear. Dr. J.S. Chahal is a professor of mathematics at Brigham Young University. He received his Ph.D. from Johns Hopkins University and after spending a couple of years at the University of Wisconsin as a post doc, he joined Brigham Young University as an assistant professor and has been there ever since. He specializes and has published a number of papers about number theory. For hobbies, he likes to travel and hike, the reason he accepted the position at Brigham Young University.